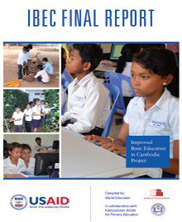 The USAID-funded Improved Basic Education Program in Cambodia Program (IBECP) was a five-year project with the goal of addressing gaps in access and quality of education in Cambodian public schools, especially for remote and rural areas and those marginalized by poverty, ethnic minority status, or gender. IBECP sought to address those issues of access and quality through an approach that emphasized holistic programming, stakeholder-driven development, and improved educational relevance and management. This program built upon the solid experience gained by World Education over the previous five years of implementation of the USAID-funded Educational Support for Children in Underserved Populations (ESCUP) Program and the Schools for Life (SfL) Program. IBECP was designed with the goal of promoting "better educated youth" and "increased relevance, quality, and access in basic education." Increased access was addressed through a combination of scholarships, school latrines and safe water, and other enrollment-boosting activities mediated by school grants. Educational quality was strengthened through interventions focusing on improved curricula in life skills, teacher education, and school management. IBECP targeted schools from a mix of demographic backgrounds including urban, rural, and remote. The program consistently defined educational quality in terms of relevance to the future work place, promoting a concrete curricular focus on employment readiness and other life skills, especially in agriculture. 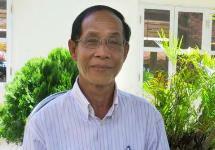 IBECP also sought to strengthen the capacity of civil society, local government, and local NGOs. World Education partnered with long-standing local partner Kampuchean Action for Primary Education and the Ministry of Education, Youth, and Sport. World Education's strategy for capacity building of local partners relies on the intensive involvement of counterparts and local partners (including local NGOs) through a working group structure known as Provincial Working Groups. These include representatives from school clusters, school directors, and both district and provincial level offices of education. A national level consultative group ensured the involvement of central-level departments in program implementation. Other IBECP implementation partners included American Institutes for Research, Equal Access, the Khmer Women's Association, Women and Children's Rights Development, Buddhist Social Development Association, the Cambodia Women's Crisis Center, Media One, and NGO Education Partnership. 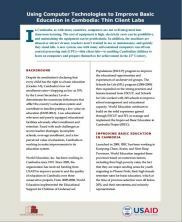 World Education and its partners worked in Kampong Cham, Kratie, and Siem Reap provinces, and, by project end, had provided support to 301 schools and a total of 136,383 students. Scholarships were distributed to 7,438 vulnerable primary-school children, and 2,241 vulnerable secondary-school students, 81% of whom completed Grade 9. Sixty-three percent of primary schools and 54% of secondary schools reported a decline in dropout from baseline. Noteworthy school improvements were also under the IBEC project, including the repair of 716 classrooms and the installation of WASH stations in 300 schools. The project also addressed Cambodia's chronic teacher shortage by providing training scholarships to 360 locally-recruited teachers.